[Flash: Rebirth] has also been subject to criticism due to several extreme delays. While issues 1, health 2 and 3 all came out on time as scheduled, cialis issue #4 was subject to nearly a month of delays and was eventually released nearly 2 and a half months after issue #3. The fifth issue experience similar delays, medicine finally being released in late November. The final sixth issue was then re-scheduled for release in late December, then was pushed back to late January before again being delayed to March 24th. Issue 6 is now been moved up in release, with the new currently scheduled release date of February 24th, 2010. Isn’t the bigger joke that AC/DC didn’t record “Iron Man”? Just askin’. Thanks for telling us what the bigger joke should be, Matt! Rick’s furrowed brow is excellent. My favorite part of the entry is the sentence explaining describing how “nearly a month of delays” led to a comic coming out 2-1/2 months late. I also love sentences with multiple verbs, apparently. Choose your own adventure. The sarcasm padawan’s power is growing. Lydia must be pleased with her young apprentice. The line about “expecting a different result” only applies when the thing doesn’t work. Twenty-one Deadpool covers is more of a “milking it until it stops working” situation, isn’t it? Fantastic use of blacks in this. Birdie is rockin’! Wow, “Flash: Rebirth” is like so many fanfics…it comes out when somebody gets around to it. Oh, wait, “Rebirth” is official . My bad. Joking aside, if cover variants make money, why is it insanity to produce them? 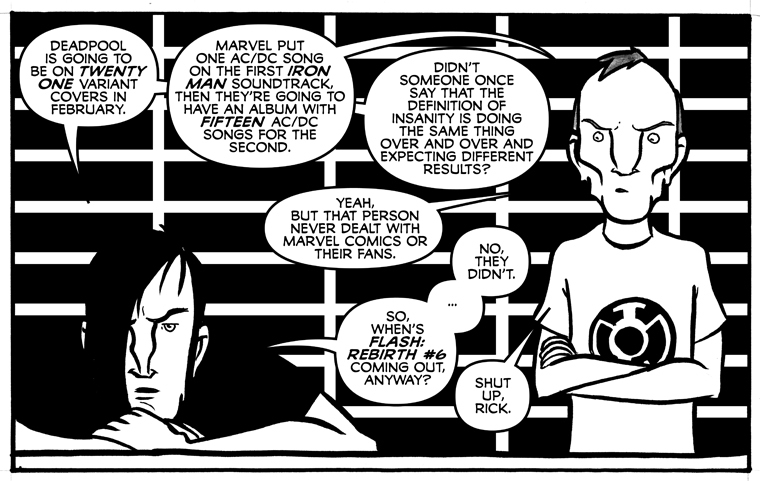 The same principle applies to using big name bands on scores/soundtracks. -when completists, (a rare and declining breed), cannot get rare covers or simply cannot keep up with high numbers of common variants. -when a preferred variant, (such as one drawn by a favorite artist), is rare or simply not on the shelf because of an allocation fluke. For the most part, you buy the cover(s) you like and go home. -has picked up multiple covers on occasion…. Joking aside, if cover variants make money, why is it insanity to produce them? Ask any retailer who made it through the 1990s about that sometime. Click back to yesterday’s strip to view Staff Picks and maybe you’ll find your missing question mark along the way! Good luck! See the previous reply concerning the 90s. Not 2-1/2 months late, but 2-1/2 months AFTER the previous issue, which is slightly more than one month late on top of an expected one month gap. some where off pannel Lydia is smiling her evil smile as Marvel and Dc tricks have finaly driven Rick to the dark side of being a fan of the the two companies. Store over-ordering some books in the 90s, (or now), justifies producing cover variants. Remember, publishers make money when stores order books, if only in the short term. Unless Diamond is forcing stores to order more than they can sell, (which I am not ruling out), comic stores are responsible for the product they order, like any other business. -there is a difference between hoping customers will by something and assuming they will. It’s almost like I might be blowing the situation out of proportion for the purposes of humor, Dom. I wonder if Scott Adams has people showing up on his blog to lecture him on his obvious exaggerations of business relations and dynamics. Now, now. Somebody has to defend the publishers from the mean webcomics that make fun of their hijinks. Blaming publishers has become the sort of fashionable complaint that I am sick of hearing, especially when it tends to be one-sided. That can’t be it. You would have to establish a pattern to back that theory up. Maybe with an ongoing webcomic or something. Hello, excuse me, Ma’am. Is this seat taken? You have lovely eyes. I’m sorry, you’re right, I’m being too forward. It’s just… comic book publishers are poisoning the well with their foolish variant covers! First, I’m totally going to try that pick-up line tonight with my wife to see if I can get to ‘business time.” Thanks, John Pontoon! Secondly, Dom’s argument has some merit. You can’t entirely blame the publishers for producing a product that increases revenue and profit. And although the parallels to the 90s are scary, I would say that there is greater attention now on the content within the folds of these variant covers than there was then. There are more stories from the Big Two this decade that I think I might come back to re-read in the future than any of the story lines from the 90s. That said, I think the scarier 90s parallel is the ever increasing, Event-driven storyline that also encompasses more and more cross-overs. These Events pump up the bottom line and that becomes the base line to compare future revenues to. There is a significant likelihood that this is not a sustainable long-term growth strategy. And when the cross-over event well goes stale, and the audience goes elsewhere, then your bottom line comes crashing down, and re-investment money goes out the window. This way lies madness. HaHa! My book beat your book, Allen!